There are mainly two different styles of gutters: K-style and Half Round. K-style is most common on new homes and Half Round is most common on traditional homes. When to get K-style gutters: You want well-functioning gutters for a reasonable price on a modern style home. When to get half round gutters: You have a traditional home and want gutters that match the historical or unique look. They may reduce the number of times you need to clean your gutters. When to get gutter guards: Your home gets a lot of larger debris that the guards can deflect, and you prefer less frequent maintenance. 5″ gutters are the most common size of gutter, usually on K-style. While custom sizes do exist, like 7″ or 8″, they are rarely needed. For Half Round gutters, bump the size up by at least one inch. Their rounded profiles reduce their capacity per size. When to get 5″ gutters: Your roof is not very large or complex and you don’t experience heavy downpours from storms. Most homes fall into this category, so if you’re unsure if you have any use for larger gutters, it probably means that you don’t. Great for large homes or industrial buildings. 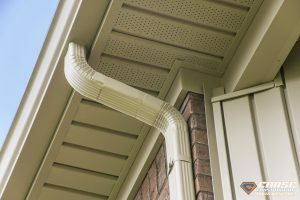 When to get 6″ gutters: Your roof is steep enough, has large enough area per gutter entry point of rainwater, or you live in a stormy area with high downpour density. The steeper the roof, the more quickly rainwater travels into the gutters. The longer the travel of rainwater, the greater the volume of rainwater in the gutters. Homes with a large enough increase may be better off with 6″ gutters instead of 5″. 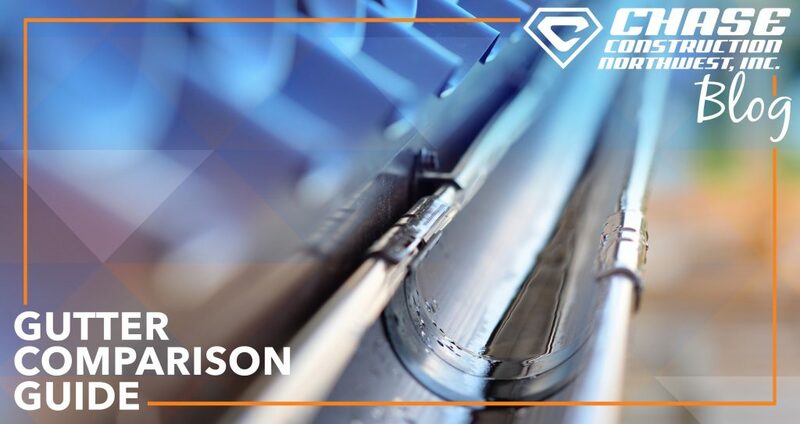 If you think 5″ K-style gutters might not be large enough for you, then Half Round gutters almost certainly will be too small since their 6″ size holds less volume than 5″ K-style. Where gutters collect rainwater, downspouts drain it. 2″x3″ downspouts are most common and they match with 5″ gutters. 3″x4″ match with 6″ gutters, yet can be installed on 5″ gutters as well. When to get 2″x3″ downspouts: You have 5″ gutters and don’t have any of the previously mentioned issues associated with drainage trouble. Most homes are in this category. Can solve many drainage problems when applied to 5″ K-style gutters. When to get 3″x4″ downspouts: You have 6″ K-style gutters or drainage issues with 5″ K-style. Many drainage problems can be solved just by increasing the downspout size (along with increasing the gutter outlet size). Sometimes increasing the gutter size alone won’t improve drainage since outflow can only be as much as the downspout allows. 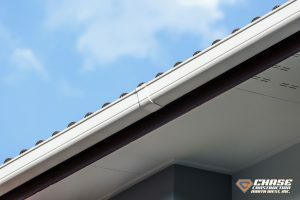 Gutters can be installed either piece-by-piece (sectional) or altogether as one piece along the gutter line (seamless). 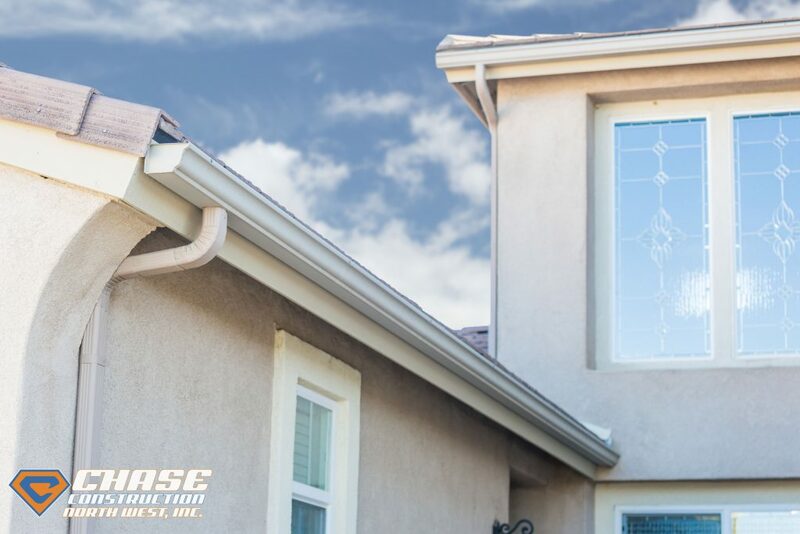 When to get seamless gutters: You want better-looking gutters that are robust against damage and leaks, and professionals are handling the installation. When to get sectional gutters: You’re doing it yourself and are willing to replace portions yourself when they leak, bend, or dent. Gutters can be made out of multiple different types of material. Each type of material has a unique set of attributes that can make one type fit perfectly for one person yet not another. When to get vinyl gutters: You live in a year-round mild climate, are on a tight budget, want to install them yourself, and are not too concerned about leaks or needing to replace them at some point down the road. When to get aluminum gutters: When you want to go low cost without unnecessarily sacrificing quality. 5″ K-style aluminum gutters are popular and well-rounded. 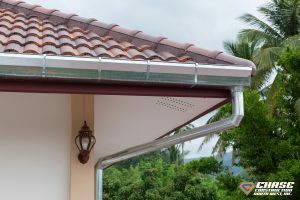 When to get steel gutters: You want to go heavy and stainless and know of a good deal or you don’t mind spending a little more for gutters that are better than most. When to get zinc gutters: You don’t want to do-it-yourself, are willing to pay for attractive gutters that last a long time, and there is no risk for them to come in contact with acidic conditions. 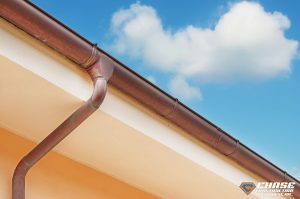 When to get copper gutters: You want to pay enough to never have to replace your gutters, and you are well informed of the unique issues involving copper (like how they change colors and can stain). There is great variety when it comes to choosing gutters. They range from cheap to expensive, rustproof to rust-prone, functional in storms to non-functional in storms, and many other factors. This guide describes the main concerns of each so that you have all the information you need to select the gutters best for you. Looking for new gutters with your new roof? Just let us know and we can make it happen! CHASE CONSTRUCTION NORTH WEST, INC. is a leading contractor in the roofing industry of Western Washington, we’re GAF MASTER ELITE® contractors, and we have been installing fantastic roofs since 2002. Give us a call at 253-445-8950 or fill out our quick estimate form! Next 5k and 6k Gutters: Which Size is Right for You? For me, the best material for gutters is copper. Although it is the most expensive of the bunch, it lasts the longest and it is also very durable and rust proof. It is pretty clear that the winner on this list is definitely copper. When it comes to the durability of the material, copper gutters reign supreme.